Real Navy Chief’s earn their anchors every day. T-shirt for Chief Petty Officers. Anchors are heavy, and they need to be earned every day. Display your CPO pride. Honor, Courage and Commitment. Lead your Sailors. These shirts are sized to fit, so make sure to take a look at the chart and consider ordering a size up. 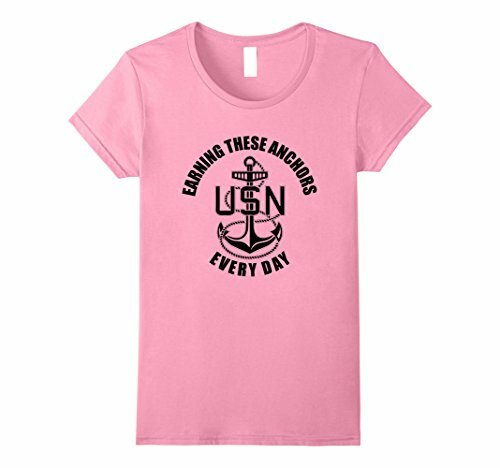 To all the brothers and sisters out there, enjoy this shirt.Real Navy Chief’s earn their anchors every day. T-shirt for Chief Petty Officers. Anchors are heavy, and they need to be earned every day. Display your CPO pride. Honor, Courage and Commitment. Lead your Sailors. These shirts are sized to fit, so make sure to take a look at the chart and consider ordering a size up. To all the brothers and sisters out there, enjoy this shirt.